I brought the Jellyfish to my guild meeting last night for the first unveiling of it being totally finished… so now I can share here! 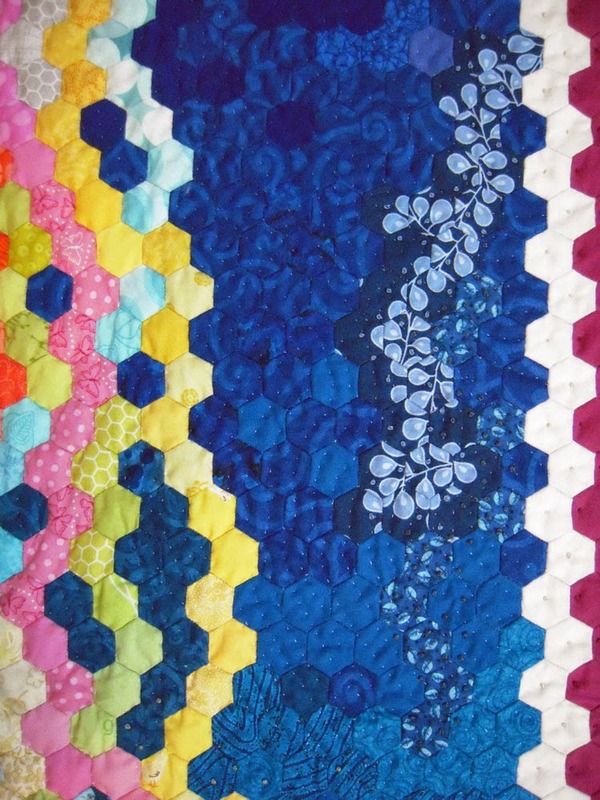 Jellyfish Hexie Quilt – Finished. Hand pieced, quilted, knotted, and bound. What a thrill to have it completed. I was just talking to a friend about how I never used to be able to finish or follow through on anything… so this is really a step up for me personally. It’s the follow-though I’m most proud of… but it sure is pretty to look at too! I tied a bunch of French Knots into this quilt – they look like bubbles and from a distance look like part of the fabric. They add so much depth and texture, I just love them. I had planned to quilt all the “water” with French Knots, but I changed my mind and used them sparingly and quilted it all with a fine silk thread. This is the lower left side – I love those little bits of red in the “water”. You can also see the French Knots I used to ‘quilt’ the border white and cerise hexies. I call this part “algae” because it ended up looking like something else floating in the water… maybe some food for the Jellyfish…? This is the head – I used even more French Knots and lightly quilted it. Here is the back… you can see a little more of the quilting here. Since I used a 100# silk thread, it’s barely visible, which gives the water a wonderful ripple-effect. 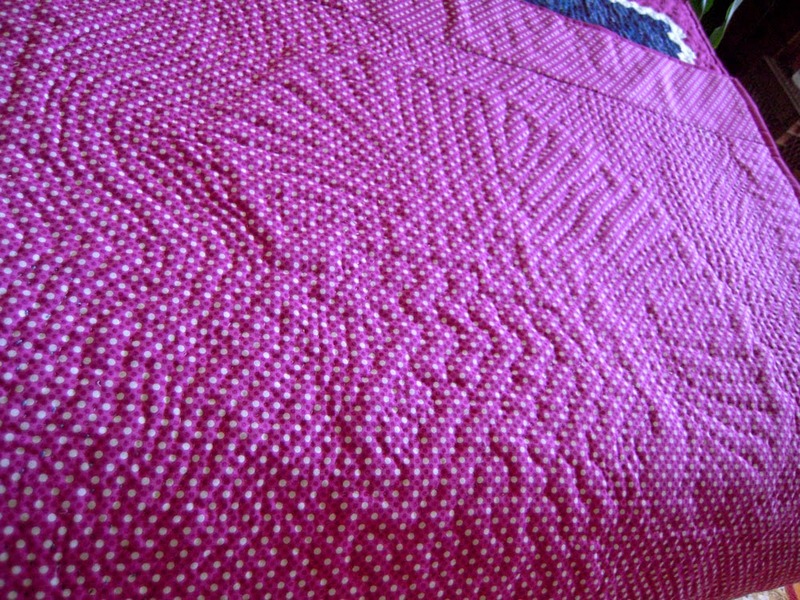 I used wool batting so it all fluffed up really sweet – shows the quilting so nicely. I’m totally hooked. I plan to use wool batting whenever I can, it’s dreamy to work with. I have about 750 hexies made for my next project. I’m unsure as to what exactly I plan to make, but I just can’t stop making them – I’m hooked. This is amazing! I love the algae and your choice of fabrics for various effects. The silk for quilting is a great idea. You are a master of epp! 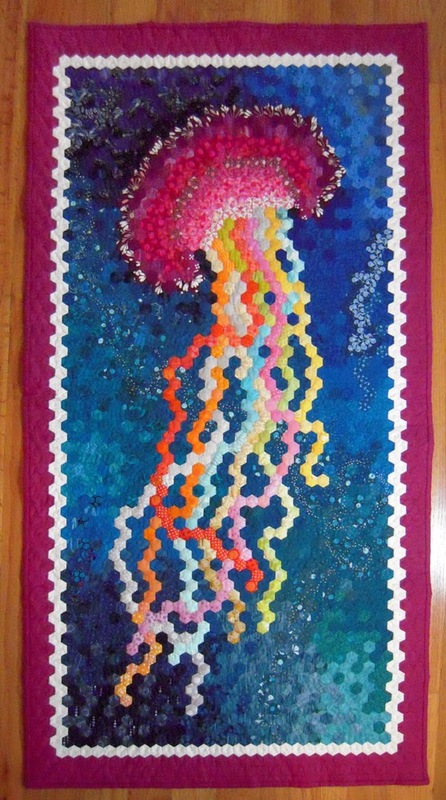 What a thrill to see your Jellyfish quilt up close and personal at the PMQG meeting Thursday night, Gail! What a work of art! Gail, I LOVE your AMAZING quilt! 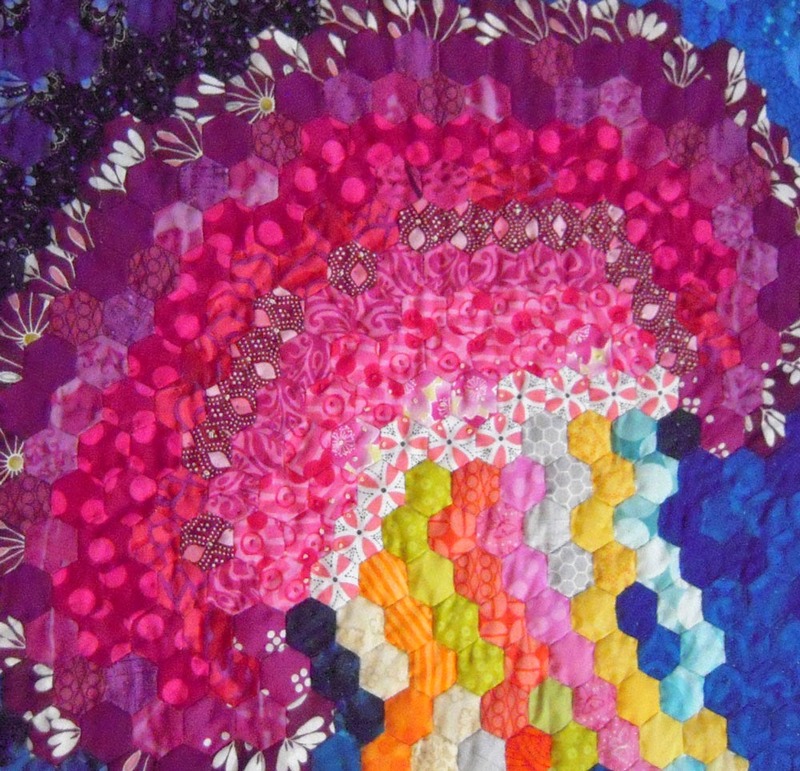 Thank you for sharing your quilt journey…and for bringing the finished masterpiece to PMQG for us to see!!! 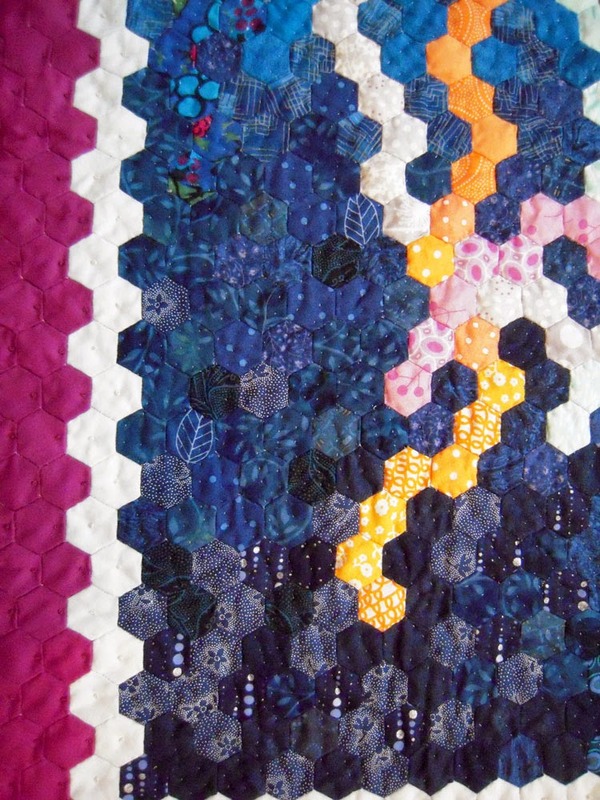 Thank you Karen, your encouragement and quilting tips on your blog have really helped me to the finish! 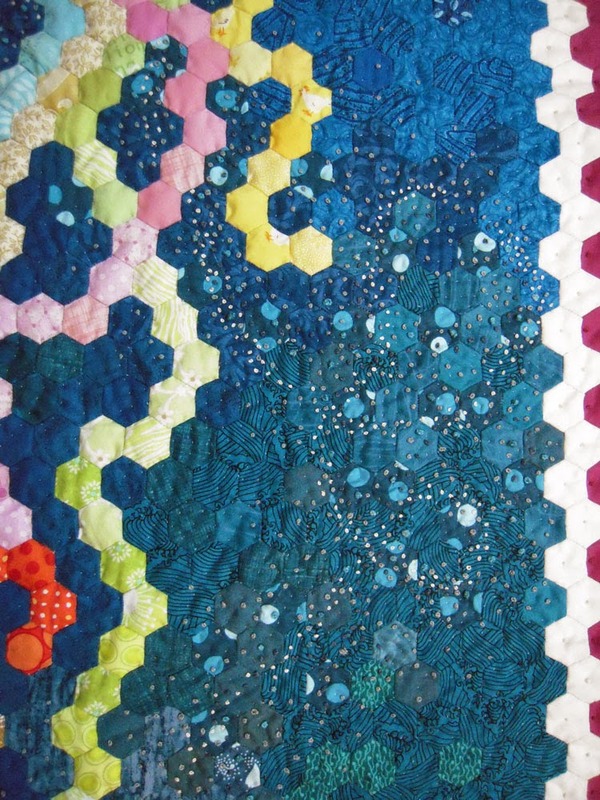 Thanks Dawn… your quilt was really amazing too – I love our guild! Thanks for all your support! I hope I get to see it in person someday! Your work is really otherworldly. No one does what you do, and I really love seeing the work of artists with such a distinct voice. Thanks! 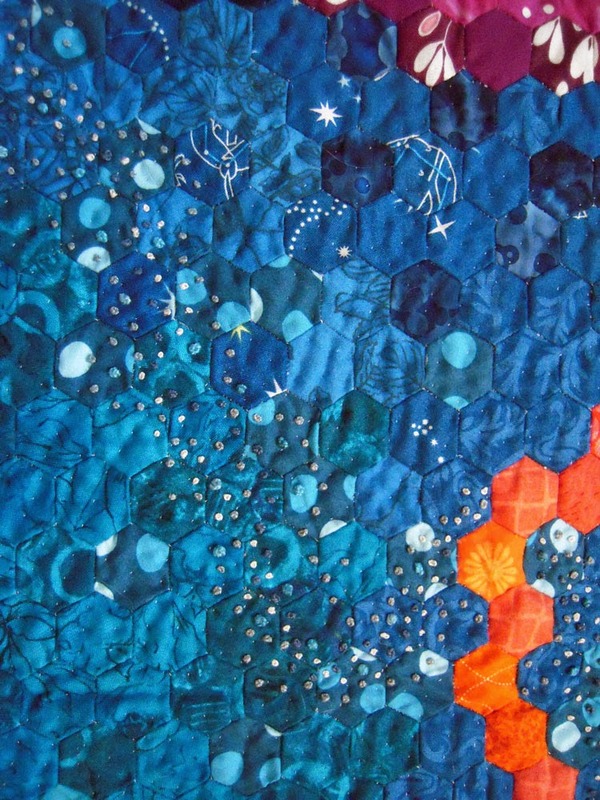 The Jellyfish will be showing at the Northwest Quilting Expo at the Portland Expo Center from Sept 24-26th, 2015. Maybe I'll see you there!